Call it what you want. Gorilla walk, orang utan walk, monkey walk, this is a standard Kyokushin warm up exercise that strikes fear in the hearts of beginners. We Kyokushin karateka like to up the difficulty by using our knuckles, instead of our palms, you know, to strengthen those wrists for punches. If I had to walk with 70% of my body weight using my arms, I’d have arms that size too! Most important of all, DO NOT CHEAT! The great (or not so great, depending how you look at it) thing about this drill is, the longe r you do it, the more difficult it gets. Not because of fatigue, but due to the sweat soaking your knuckles which are rubbing raw on the wooden/rubber flooring. The drill forces you to have a properly clenched fist because even a slight misalignment of your wrist, causes the skin to loosen and eventually peel off. And if you have the luck to have the skin peel off before completing your lap, you are performing the drill on raw meat (that used to be your knuckles). Not only that, the effects of gorilla walk is still felt after class. 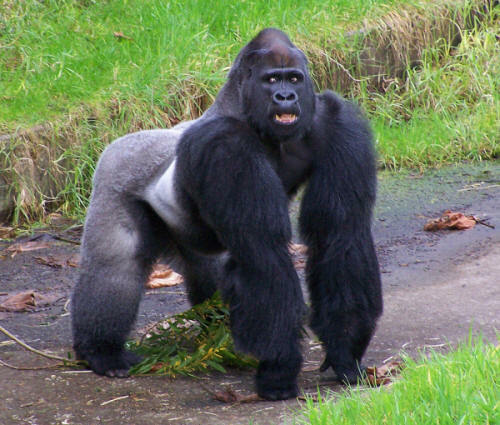 Every time you wash your hands, or bathe, or when it rains, you are reminded of the arm strength of a gorilla walking using his arms. *If you find this article amusing/interesting/useful, please click share below.